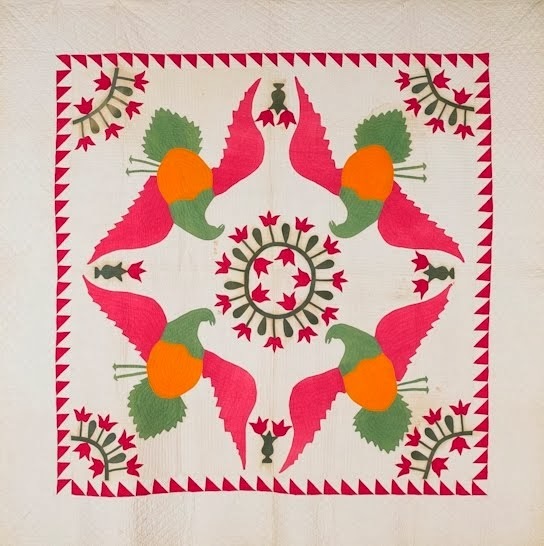 Here is a wonderful Carolina Lily quilt from circa 1850 that was part of the "Behind the Scenes" tour of the Johnson County Museum (Overland Park, Kansas). This was part of the tour with MOKA (Missouri, Oklahoma, Kansas, Arkansas Quilt Study Group) where I was the featured speaker and did two antique quilt lectures/trunk shows. 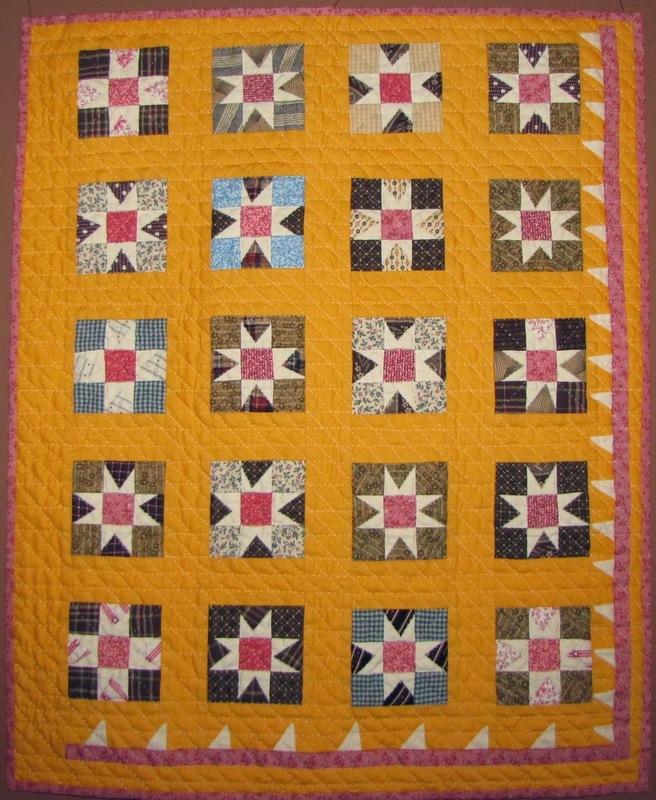 Look at all that beautiful hand quilting, wreaths and triple rod lines, etc. The blue fabric had a number of places where the fabric was missing (click on picture to enlarge). Closer inspection showed that the fabric had a pink/red stripe that was outlined in black. It is clear that the black dye or more likely the mordant used to make the black dye bond with the fabric was corrosive and damaged the underlying fabric. And once the black outline was gone the pink stripe fell away. This problem is most often seen on mid-nineteenth century Turkey red fabrics that end of looking like dots have been carefully cut out of them - a phenomena we often call "popping". The offending evil black outline ... starting to tear away at the top right edge of the stripe. I have seen this evil outline often on Turkey red prints but never on another color of fabric. The black likely has metallic elements that cause the damage.